Our new oils combine full-spectrum organic hemp extract with wildcrafted essential oils to help balance the nervous system, decrease stress, and naturally deepen your sleep. The oils work in synergy by means of their pleasant and harmonious aroma, and their phytochemical compounds that penetrate the skin. CBD stands for Cannabidiol, a powerful compound found naturally in cannabis, an herbaceous flowering plant. The word cannabis is also used in botany to describe a group of species, among which is marijuana. At Open Heart Apothecary, all of our CBD comes from Colorado-grown Hemp, which is legal in all 50 US states as of the 2014 Farm Bill. In accordance with federal regulations, we cannot make health claims regarding the use of CBD oil, however, there is a growing field of research that CBD has effectively helped individuals with pain relief, sleep support, and anxiety. The benefits of CBD used both topically and internally are due to the endocannabinoid system. Every organ in the human body is filled with neurotransmitters called endocannabinoids. They are located most prominently in the brain, connective tissues, glands, and immune cells. This sophisticated system helps create homeostasis in the body – including temperature regulation, pain relief, hormonal balance, resistance to infection, and more. CBD oil contains biological compounds called cannabinoids that act like a “key” to unlock these neurotransmitters. The body receives cannabinoids as though they were a natural product of the body itself, and therefore creates a very harmonious response. Does it have psychoactive effects / Will it make me feel "high?" No. While hemp has almost identical therapeutic compounds as cannabis, it lacks the THC which is responsible for the psychoactive effects. Our CBD does not contain any THC and is lab-tested to ensure quality control. What are the Benefits of the Essential Oil Roll-ons? The CBD essential oil blends have the additional benefit of aromatherapy to enhance the vitality of your body, mind, and spirit. CBD and essential oils work in amazing synergy to balance the nervous system. These are applied directly to the skin and enter the body through the bloodstream as well as the olfactory (scent) system. Reapply frequently throughout the day to the pulse points at your wrists and sides of neck/jawline. What is in your CBD Roll-ons? Restore Oil: 25mg of Full-Spectrum Hemp Extract CBD oil from Colorado, Certified Organic Canadian-grown Hemp Seed Oil, Natural Jojoba Oil, 100% pure essential oils of Vanilla, Cardamom, Ho Wood, French Lavender, and Spikenard. 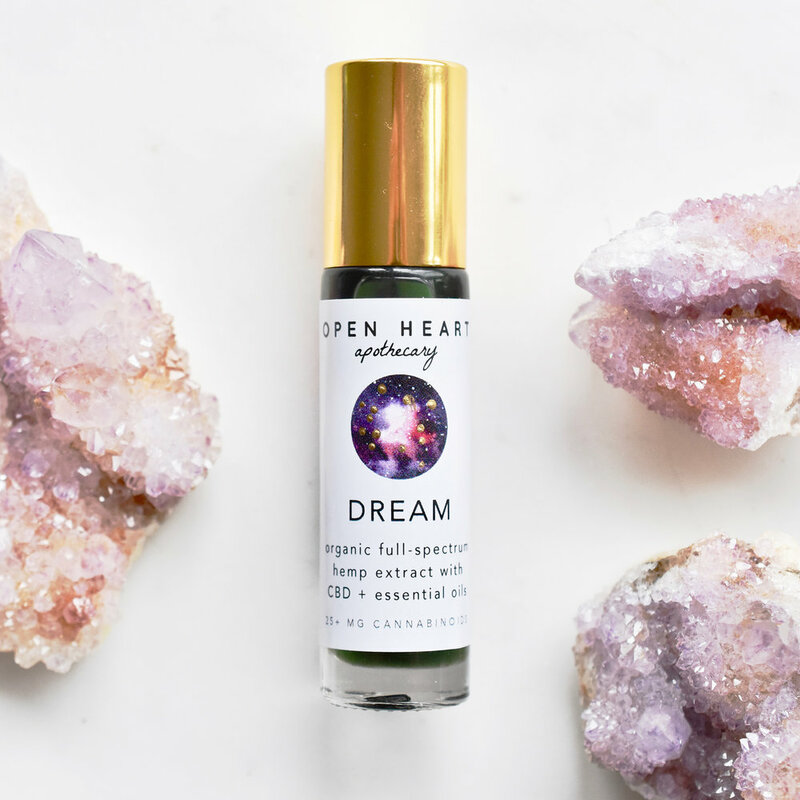 Dream Oil: 25mg of Full-Spectrum Hemp Extract CBD oil from Colorado, Certified Organic Canadian-grown Hemp Seed Oil, Natural Jojoba Oil, 100% pure essential oils of Kashmir and French Lavender, Elemi, Rose Otto, Sweet Orange, and Blue Tansy.